Editors: Lupeikiene, A., Vasilecas, O., Dzemyda, G.
Intelligent Transportation Systems (ITS) are the model for integrating advanced information technology, data communication transmission technology, electronic sensing technology, control technology and computer technology into a comprehensive ground traffic management system. They are the direction of development for future transportation systems. 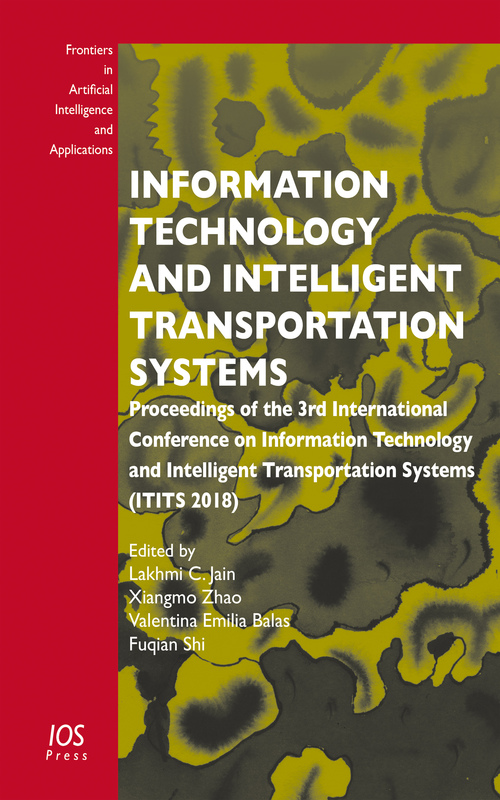 This book presents the proceedings of the 3rd International Conference on Information Technology and Intelligent Transportation Systems (ITITS 2018), held in Xi’an, China, on 15-16 September 2018. The conference provides a platform for professionals and researchers from industry and academia to present and discuss recent advances in the field of information technology and intelligent transportation systems. Intelligent transport systems vary in the technologies they apply, from basic management systems to more application-based systems. Information technology – including wireless communication, computational technologies, floating car data/floating cellular data, sensor technologies, and video vehicle detection – is also intrinsic to intelligent transportation systems. All papers were reviewed by 3-4 referees, and the program chairs of the conference committee made their selections based on the score of each paper. This year, ITITS 2018 received more than 168 papers from 4 countries, of which 41 papers were accepted. Offering a state-of-the-art overview of the theoretical and applied topics related to ITS, this book will be of interest to all those working in the field. Editors: Jain, L.C., Zhao, X., Balas, V.E., Shi, F.
Information modeling and knowledge bases have become essential subjects in the last three decades, not only in academic communities related to information systems and computer science, but also in the areas of business where information technology is applied. 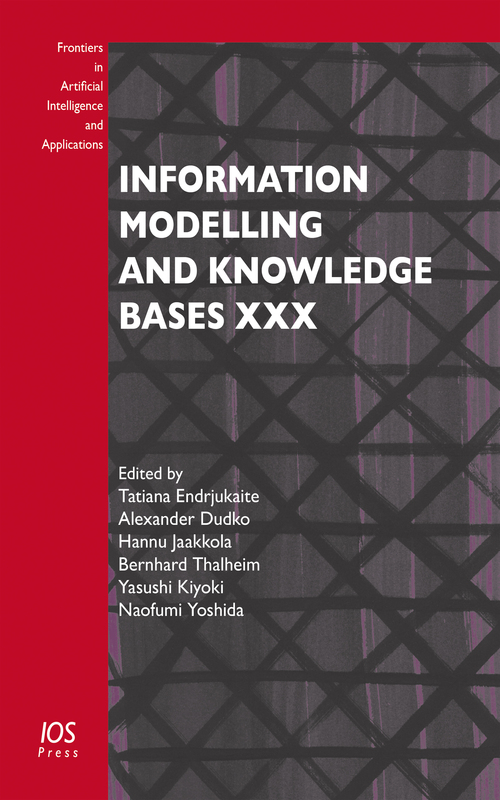 This book presents the proceedings of the 28th International Conference on Information Modelling and Knowledge Bases (EJC2018), held in Riga, Latvia from 4–8 June 2018. The aim of the conference was to bring together experts with a common interest in the understanding and solving of problems on information modelling and knowledge bases, as well as those from different areas of computer science and other disciplines who apply the results of research to practice. The 39 accepted papers collected here cover a variety of topics, including: conceptual modeling; knowledge and information modeling and discovery; linguistic modeling; cross-cultural communication and social computing; multimedia data modeling and systems; and environmental modeling and engineering. The book will be of interest to researchers and practitioners alike, and to anyone wanting a better understanding of current advances in information technology. Editors: Endrjukaite, T., Dudko, A., Jaakkola, H., Thalheim, B., Kiyoki, Y., Yoshida, N.
Artificial intelligence as applied to the legal domain has gained momentum thanks to the large, annotated corporate legal and case-law collections, human chats, and social media information now available in open data. Often represented in XML or other Semantic Web technologies, these now make it possible to use the AI theory developed by the JURIX community in over thirty years of research. Innovative machine and deep-learning techniques with which to classify legal texts and detect terms, principles, concepts, evidence, named entities, and rules are also emerging, and the last five years have seen a gradual increase in their practical application. This book presents papers from the 31st International Conference on Legal Knowledge and Information Systems (JURIX 2018), held in Groningen, the Netherlands, in December 2018. The support of the Dutch Foundation for Legal Knowledge Based Systems for the JURIX conference has transformed a domestic workshop into an international event, with theoretical contributions, applied work, demo prototypes, a hackathon, and a doctoral consortium. Of the 72 submissions received, 17 full papers and 11 short papers were selected for publication, representing an acceptance rate of approximately 38%. Machine learning for the legal domain prevails in the JURIX 2018 program, with traditional research mainstreams concerning legal reasoning and argumentation, natural-language processing, legal-text retrieval, and legal semantic modelling. An emerging topic is blockchain, which has graduated from the workshop area to the main program. The book offers an overview of the ways in which innovative information technologies are merging with legal theory, argumentation, and practice. Editors: Coeckelbergh, M., Loh, J., Funk, M., Seibt, J., Nørskov, M.
The deployment of intelligent systems to tackle complex processes is now commonplace in many fields from medicine and agriculture to industry and tourism. This book presents scientific contributions from the 1st International Conference on Applications of Intelligent Systems (APPIS 2018) held at the Museo Elder in Las Palmas de Gran Canaria, Spain, from 10 to 12 January 2018. The aim of APPIS 2018 was to bring together scientists working on the development of intelligent computer systems and methods for machine learning, artificial intelligence, pattern recognition, and related techniques with an emphasis on their application to various problems. The 34 peer-reviewed papers included here cover an extraordinarily wide variety of topics – everything from semi-supervised learning to matching electro-chemical sensor information with human odor perception – but what they all have in common is the design and application of intelligent systems and their role in tackling diverse and complex challenges. The book will be of particular interest to all those involved in the development and application of intelligent systems. Editors: Petkov, N., Strisciuglio, N., Travieso-González, C.M. Big Data Analytics is on the rise in the last years of the current decade. Data are overwhelming the computation capacity of high performance servers. Cloud, grid, edge and fog computing are a few examples of the current hype. Computational Intelligence offers two faces to deal with the development of models: on the one hand, the crisp approach, which considers for every variable an exact value and, on the other hand, the fuzzy focus, which copes with values between two boundaries. This book presents 114 papers from the 4th International Conference on Fuzzy Systems and Data Mining (FSDM 2018), held in Bangkok, Thailand, from 16 to 19 November 2018. All papers were carefully reviewed by program committee members, who took into consideration the breadth and depth of the research topics that fall within the scope of FSDM. The acceptance rate was 32.85%. Offering a state-of-the-art overview of fuzzy systems and data mining, the publication will be of interest to all those whose work involves data science. It is almost impossible today to find an economic sector or aspect of society which does not involve AI techniques in some way. This pervasive technology has become indispensible in a multitude of ways, from supporting decision making to managing digital devices such as smart sensors, mechanical arms or artificial eyes. The ability of AI to emulate intelligence in the resolution of challenging problems has placed it at the centre of problem solving in all areas of our society. This book presents contributions from CCIA 2018, the 21st International Conference of the Catalan Association for Artificial Intelligence which took place in Alt Empordà, Catalonia, Spain, on 8-10th October 2018. The book aims to provide a picture of what is being achieved and what is under development in AI today. As such, its contents represent the diversity of approaches and applications currently being researched, but it also presents invited contributions which deal with some of the challenges that will have to be faced in the decade to come. The contributions included in this book are organized under the following headings: logic, satisfiability and fuzzy sets; classifiers, networks and machine learning; data science, recommender systems and case-based reasoning; natural language and sound processing; cognitive systems and agents; and computer vision and robotics. The book also covers a number of current AI challenges and new trends like big data, spatial problem solving, ethics and AI, and how blockchain impacts AI. 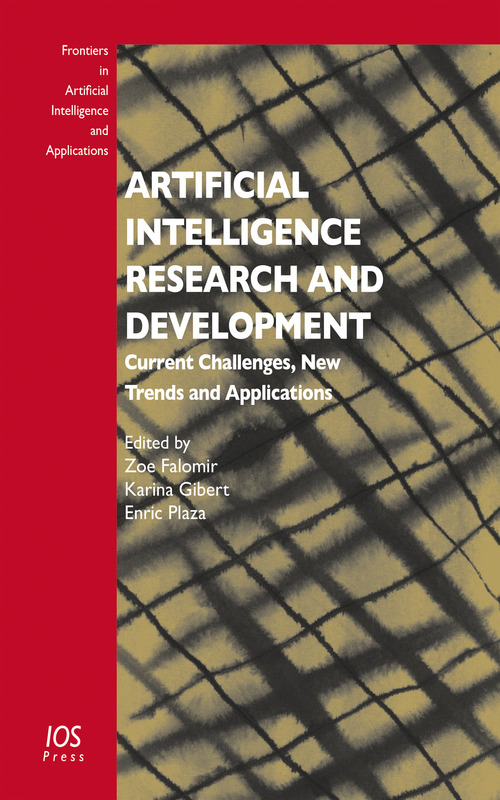 Providing an up-to-the-minute overview of current AI technology and research, this book will be of value to all those with an interest in the subject. Editors: Falomir, Z., Gibert, K., Plaza, E.
Computational linguistics, speech processing, natural language processing and language technologies in general have all become increasingly important in an era of all-pervading technological development. 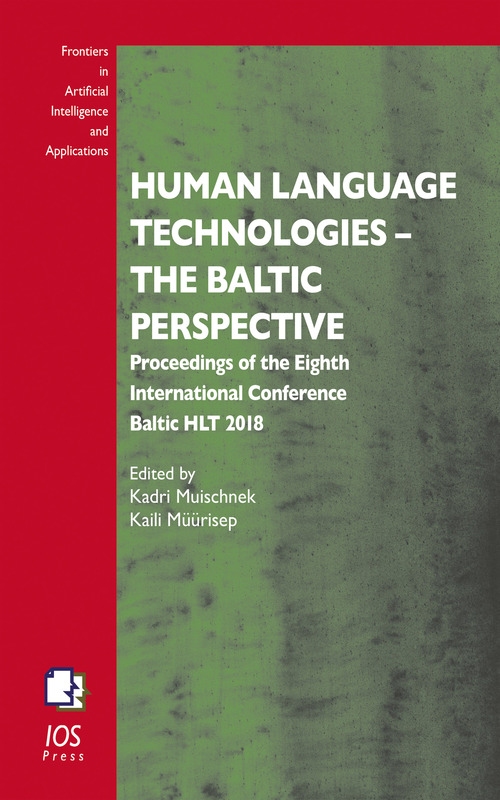 This book, Human Language Technologies – The Baltic Perspective, presents the proceedings of the 8th International Baltic Human Language Technologies Conference (Baltic HLT 2018), held in Tartu, Estonia, on 27-29 September 2018. The main aim of Baltic HLT is to provide a forum for sharing new ideas and recent advances in computational linguistics and related disciplines, and to promote cooperation between the research communities of the Baltic States and beyond. The 24 articles in this volume cover a wide range of subjects, including machine translation, automatic morphology, text classification, various language resources, and NLP pipelines, as well as speech technology; the latter being the most popular topic with 8 papers. Delivering an overview of the state-of-the-art language technologies from a Baltic perspective, the book will be of interest to all those whose work involves language processing in whatever form. Editors: Muischnek, K., Müürisep, K.
In its classical form, the study of argumentation focuses on human-oriented uses of argument, such as whether an argument is legitimate or flawed, engagement in debate, or the rhetorical aspects of argumentation. In recent decades, however, the study of logic and computational models of argumentation has emerged as a growing sub-area of AI. This book presents the Seventh International Conference on Computational Models of Argument (COMMA’18), held in Warsaw, Poland, from 12 to 14 September 2018. Since its inception in 2006, the conference and its related activities have developed alongside the steady growth of interest in computational argumentation worldwide, and the selection of 25 full papers and 17 short papers, out of a total of 70 submissions, and 15 demonstration abstracts included here reflect the broad multidisciplinary nature of argumentation and the increasing body of work which establishes the relevance of computational models to various disciplines and real world applications. Subjects covered include: algorithm development; innovative applications; argument mining, argumentation-based models of dialogue; abstract argument frameworks; and structured argumentation. Representing an overview of current developments in the field, this book will appeal to all those with an interest in computational models of argument. Editors: Modgil, S., Budzynska, K., Lawrence, J.